Thank you for your interest in joining Sky. Great news - we’ve got fantastic offers for you to enjoy in your new home. Plus, you can add totally unlimited broadband from £18 a month in the next step. Sky Q set-up fee applies. 18-month min term. Never miss another show, with up to 65 channels all in one place - including Sky Atlantic, BBC iPlayer and ITV Encore. You can even watch the latest shows from up to 30 days ago. Catch more of your favourites with Sky Q. Record 3 shows, watch a 4th, and store up to 500 hours of TV on our 1TB box. 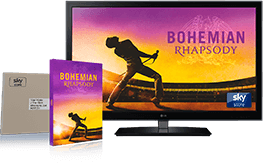 Bring the shows you love to life with stunning picture quality and a more vivid viewing experience including greater detail and brighter colour. See nature in all its glory, or high definition dramas that make even the bad guys look good. Includes over 40 high definition channels and great 3D content on demand. Ultimate On Demand brings you the best TV all in one place from Sky and Netflix. Watch back-to-back episodes of your favourite Sky Box Sets, Netflix shows & movies. Download shows on Sky or Netflix apps to watch whenever & wherever you want. Discover a world packed full of great characters and shows from Cartoon Network and Disney, to Nickelodeon and Baby TV. With no shows for grown-ups, the young ones can enjoy the shows they love - from Adventure Time to iCarly. And with the Sky Kids app, now available on mobile, you get even more, including the Sky Kids channel and Kids Vids. £30 Ultimate On Demand Bundle: Offer entitles recipient to Sky Entertainment, Ultimate On Demand and HD for £30 a month for 18 months. After 18 months standard pricing applies (£27 Sky Entertainment, £12 Ultimate On Demand & £5 HD). Savings compares against total monthly prices after 18 months for Sky Entertainment, Ultimate On Demand and HD. Not available with any other offers. Ultimate On Demand: Selection of shows/series available and varies each month. On Demand requires broadband connection (minimum recommended speed: SD: 3 Mb/s, HD: 8Mb/s UHD: 24Mb/s). Downloads count towards any usage cap and may expire from your Planner. Downloading a 30-minute show typically uses 0.5GB. Content depends on your Sky TV / HD subscription. Set Up fees apply. Offer ends 31 March 2019. £30 Cinema Bundle: Offer entitles recipient to Sky Entertainment, Sky Cinema, HD for £30 a month for 18 months. After 18 months standard pricing applies (£27 Sky Entertainment, £19 Sky Cinema & £5 HD.) Not available with any other offers. On Demand requires broadband connection (minimum recommended speed: SD: 3 Mb/s, HD: 8Mb/s UHD: 24Mb/s). Downloads count towards any usage cap and may expire from your Planner. Downloading a 30-minute show typically uses 0.5GB. Content depends on your Sky TV / HD subscription. Set up fees apply. Offer ends 31 March 2019. £40 Best of Sky Bundle: Offer entitles recipient to Sky Entertainment, Sky Cinema, Kids, Ultimate On Demand and HD for £40 a month for 18 months. After 18 months standard pricing applies (£27 Sky Entertainment, £19 Sky Cinema, £5 Kids, £12 Ultimate On Demand & £5 HD). Savings compares against total monthly prices after 18 months for Sky Entertainment, Sky Cinema, Kids, Ultimate On Demand and HD. Not available with any other offers. Ultimate On Demand: Selection of shows/series available and varies each month. Sky Kids app: Selected content available to stream on demand at no extra cost via 3G/4G/WiFi (charges may apply). On Demand requires broadband connection (minimum recommended speed: SD: 3 Mb/s, HD: 8Mb/s UHD: 24Mb/s). Downloads count towards any usage cap and may expire from your Planner. Downloading a 30-minute show typically uses 0.5GB. Content depends on your Sky TV / HD subscription. Set up fees apply. Offer ends 31 March 2019. £40 Best of Sports Bundle: Offer entitles recipient to Sky Entertainment, Sky Sports HD, HD for £40 a month for 18 months. After 18 months standard pricing applies (£27 Sky Entertainment, £30 Sky Sports & £5 HD.) Savings compares against total monthly prices after 18 months for Sky Entertainment, Sky Sports HD and HD. Not available with any other offers. Ultimate On Demand: Selection of shows/series available and varies each month. Sky Kids app: Selected content available to stream on demand at no extra cost via 3G/4G/WiFi (charges may apply). On Demand requires broadband connection (minimum recommended speed: SD: 3 Mb/s, HD: 8Mb/s UHD: 24Mb/s). Downloads count towards any usage cap and may expire from your Planner. Downloading a 30-minute show typically uses 0.5GB. Content depends on your Sky TV / HD subscription. Set up fees apply. Offer ends 31 March 2019. £45 Sports & Cinema Bundle: Offer entitles recipient to Sky Entertainment, Sky Sports HD, Sky Cinema, HD pack for £40 a month for 18 months. After 18 months standard pricing applies (£27 Sky Entertainment, £19 Sky Cinema, £30 Sky Sports & £5 HD.) Savings compares against total monthly prices after 18 months for Sky Entertainment, Sky Sports HD, Sky Cinema and HD. Not available with any other offers. On Demand requires broadband connection (minimum recommended speed: SD: 3 Mb/s, HD: 8Mb/s UHD: 24Mb/s). Downloads count towards any usage cap and may expire from your Planner. Downloading a 30-minute show typically uses 0.5GB. Content depends on your Sky TV / HD subscription. Set up fees apply. Offer ends 31 March 2019.